Remember the Christopher Walken skit on Saturday Night Live where the inveterate creepy guy continues asking Will Ferrell for more cowbell? 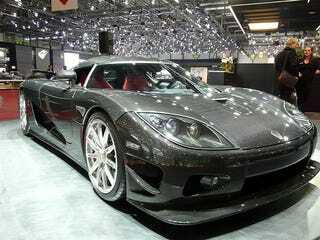 Well the Koenigsegg CCXR Edition needs more carbon fiber. The rebodied CCX is positively rotten with the stuff and the twin turbocharged, E85 sipping 1018 HP heart makes us almost feel like this outshines the Bugatti Veyron Fbg par Hermes which sits just down the row. This car speaks to our inner 17-year-old like a like a prom queen on a bender. The Koenigsegg CCXR Edition is a duel fuel car, running on plain old dino juice the 4.8L twin turbo V8 cranks out 888 BHP. Fill 'er up with E85 ethanol and the car snorts out that mind bending 1085 BHP and will crush your internal organs on its way to sixty in less than 2.9 seconds, 125 MPH (or 200 KPH) doesn't take much longer at 8.9 ticks. Er... yeah, numbers like that don't even make sense to us but we like that kind of thinking. More cowbell!